The earliest of the four Hindu religious scriptures known as the Vedas, and the first extensive composition to survive in any Indo-European language, the Rig Veda (c. 1200-900 BC) is a collection of over 1,000 individual Sanskrit hymns. 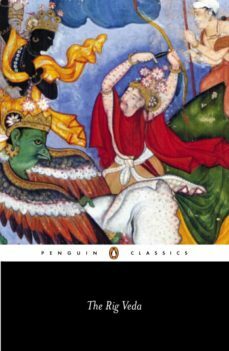 A work of intricate beauty, it provides a unique insight into early Indian mythology, religion and culture. This selection of 108 of the hymns, chosen for their eloquence and wisdom, focuses on the enduring themes of creation, sacrifice, death, women, the sacred plant soma and the gods. Inspirational and profound, it provides a fascinating introduction to one of the founding texts of Hindu scripture - an awesome and venerable ancient work of Vedic ritual, prayer, philosophy, legend and faith.